Ludlow was described by John Betjeman as "the loveliest town in England". 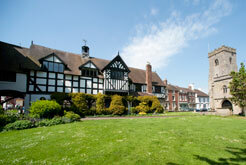 It has a lively market, food fairs, speciality food shops and numerous restaurants and Inns. 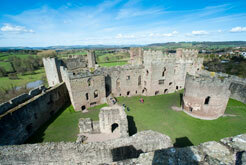 With over 500 listed buildings, mainly Georgian or half-timbered, Ludlow is a feast for the eyes. Experience daily life on an upland farm at the turn of the 19th century; See milking by hand, butter making in the dairy and demonstrations of period skills and visits from the Wheelwright, Farrier and Blacksmith. A quintessentially English town, off the beaten track and the birthplace of William Penny Brookes, founding father of the Modern Olympic Games!